The celebrity chef and brewer Sam Calagione call on craft brewers to eliminate food waste with their new collaborative beer. 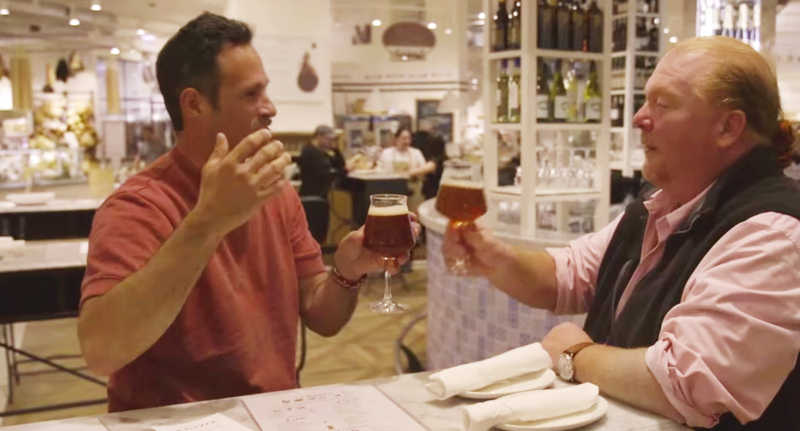 In October, chef and restaurant owner, Mario Batali and Delaware-based brewer Sam Calagione launched a new experiment: beer made out of food waste. Calagione is the owner of Dogfish Head Craft Brewery and the personality behind a new web series called That’s Odd…Let’s Drink It!, which follows his efforts to create collaborative brews with celebrities of various backgrounds. In the show, the beer he made with Batali is dubbed “WasteNot,” and it’s modeled after a pruno, or prison wine. The unusual brew draws inspiration from the “whatever is available” recipes from prisoners, which historically include foods like citrus, ketchup, sugar, and bread. Batali’s version included overripe tomatoes, rotten grapefruit, Ugli fruit (a type of tangelo), stale bread, and Demerara sugar. The beer has been on tap at Birreria, the rooftop restaurant and microbrewery atop the Eataly marketplaces in Chicago and New York. (Batali, Calagione, and Joe Bastianich, restaurateur and Eataly partner, are all partners of the brewery.) WasteNot (designated “Pruno” on the Birreria menu) was inspired by wastED, the pop-up food waste restaurant created by author and chef Dan Barber earlier this year. Positive reception helped wastED grow into a community of chefs and other food industry members interested in reconceiving the concept of food waste. Eataly is a prime location for reducing food waste: it’s the world’s most comprehensive Italian marketplace, with its produce, groceries, and baked goods available to the restaurant kitchen upstairs. An example Batali uses in the show is tomatoes: once no longer suitable for individual sale to customers, the “B” and B-minus” tomatoes, he calls them, are pureed and used as stock in the restaurant. Repurposing food at Eataly extends beyond the tomatoes, according to Elizabeth Meltz, director of food safety and sustainability for Batali & Bastianich Hospitality Group. For example, the restaurants have been composting food waste since 2006 and they use an online platform called MintScraps to monitor trash, recycling, and compost. “The nature of having both retail and restaurant in one space allows us to pull product that we anticipate is going to expire and use it in our restaurants before it becomes unappealing to a customer,” said Meltz. Awareness about food waste is growing issue in the U.S., and a number of chefs have begun focusing on reducing it, but mainly behind the scenes. In September, the United States Department of Agriculture (USDA) and Environmental Protection Agency (EPA) announced the nation’s first-ever country-wide food waste reduction goal, calling for a 50 percent reduction by 2030. According to the announcement, 31 percent (133 billion pounds) of the overall food supply in the U.S. is lost or wasted, making food waste the single largest component of disposed municipal waste in the country, and a significant portion of greenhouse gas (methane) emissions. Reducing food losses by just 15 percent, the USDA said, would provide enough food for more than 25 million Americans each year. Focusing on food waste makes sense in the craft brewing community, Calagione said, because it’s part of a larger trend toward more sustainable practices. For instance, Dogfish Head provides spent grains after brewing to farms to use as cattle feed, and it repurposes almost all of the water used in the brewing process. Another piece of the pruno puzzle is determining whether craft beer consumers are ready for a beer brewed with ingredients that are, essentially, garbage*. But for Calagione, who has been a craft beer pioneer since launching Dogfish Head in 1995, taking innovative approaches to beer making is nothing new, and customers have been receptive of the nontraditional ingredients used in his and other craft brewers’ beers for several years. The WasteNot recipe was based on a traditional Hefeweizen, or German beer, in which wheat plays a major role (as opposed to malted barley) in the malt bill, and yeast byproducts, called esters, lend fruity aromas and flavors. Wheat beers are often brewed with orange peel and coriander, making Batali’s citrus-forward pruno a suitable interpretation of the style. At the beer’s debut in New York, where 217 gallons of WasteNot were brewed this fall, Birreria customers described the beer as “light, crisp, a little effervescent,” “delicious,” and “absolutely amazing.” Based on personal experience, the beer had a pleasant grapefruit and sourdough aroma and flavor with a soft, lightly effervescent mouthfeel. The beer is cask conditioned, meaning it is unfiltered, unpasteurized, and naturally carbonated in a cask, rather than force-carbonated with carbon dioxide or nitrogen. According to Birreria New York head brewer, Fred Avila, WasteNot, or “Pruno,” will most likely be available through the middle of January. Although there are no immediate plans to brew up another batch at Birreria, Calagione said he and Batali intend to continue their efforts next year. “We hope to brew it annually at the Birreria locations in Chicago and New York. When we brew the batches again, we will help promote the wastED awareness,” he said. For Meltz, the larger goal is a paradigm shift, beginning with language. “There are some of us who would like to get away from calling it ‘waste,’ as much of what we are talking about is perfectly edible,” she said. And with each pint of WasteNot poured at Birreria, Batali, and Calagione might just be moving the brewery world in that direction. *After conducting a 24-hour Twitter poll @BeerAffair on Nov. 4, 2015, “Would you drink a craft beer made with rotten fruit/other food waste?” the results were, interestingly, 50/50.